Cats and dogs can’t eat the same food for a number of reasons. First and foremost, cats are obligate carnivores whereas dogs are omnivores. This means that cats are meant to eat only meat, whereas dogs can eat a mixture of meat and plant-based foods. A dog could survive on plant matter alone (though perhaps not thrive without supplementation). However, it should be noted that although dogs can tolerate cheap grain-based foods better than cats, such foods are not good for their long-term health. The reason why cats are carnivores and dogs are omnivores is that they have different vitamin, protein, and fat requirements. Although both cats and dogs need vitamin A, dogs have enzymes that enable them to obtain it from plants by converting carotenoids. Cats lack these enzymes, so they must eat animals that have the enzymes to produce their own active vitamin A from plant-based foods (such as mice). Dogs also have the option of converting Tryptophan (an amino acid found in both animal and plant-based food sources) to niacin, a required B vitamin. Because cats can’t do this, they must get their niacin by eating an animal that can. Cats that eat a balanced all-protein diet will use approximately 12% of it for maintenance and 20% for growth metabolism. Dogs, by contrast, will use 4% and 12% respectively. This is why good cat foods are higher in protein than dog foods. Amino acids are the building blocks of proteins. Although both cats and dogs need to consume the amino acid Arginine, cats need more of it. Taurine, another amino acid, is made internally by dogs but not cats. Cats need to get Taurine from animal-based foods, as there is no Taurine in plant matter. Cats also require the sulphur amino acid Cysteine to manufacture a chemical called Felinine, and Cysteine is most abundant in animal-based food sources. A cat’s body can’t make an essential fatty acid called Arachidonic Acid (obtained via meats, eggs, and dairy products), whereas a dog’s can as long as it consumes sufficient linoleic acid (found in vegetable oils). Thus, Arachidonic Acid is essential for cats but not for dogs. Also, while a dog can easily utilize its fat stores as a source of energy, a cat’s body breaks down non-fatty tissues as an energy source. This means that dogs can tolerate fasting more easily than cats. Cats can become quite ill if they don’t get sufficient fat. A starved cat can develop a life-threatening disorder called hepatic lipidosis. For this reason, when putting an obese cat on a diet, consult a veterinarian for advice before beginning and aim for very gradual weight loss, or better yet, help the cat lose weight through increased exercise (see How to Help Fat Cats Lose Weight for more information). 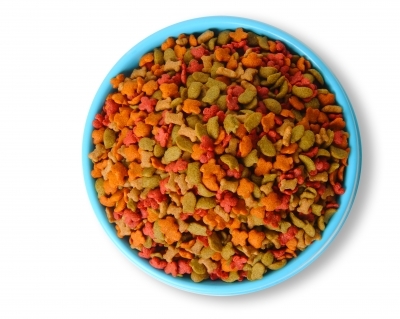 Because cat food has more fat than dog food, it’s very appealing to dogs. Although an occasional snack is unlikely to do any harm, dogs that eat cat food regularly may suffer diarrhea, vomiting, and nutritional imbalances, and cats that regularly eat dog food can become dangerously undernourished and ill.
ASPCA. (2011). “Feeding Dogs Cat Food.” ASPCA.org. DHA/EPA Omega-3 Institute. (2010). “Dietary Sources of Omega-3 Fatty Acids.” DHAOmega3.org. Dunn, TJ, Jr., DVM. (n.d.). “Cats are Different.” ThePetCenter.com. Veterinary & Aquatic Services Department, Drs. Foster & Smith. (2011). “Foods to Avoid Feeding Your Dog.” PetEducation.com.